Anson, Beaufort, Bertie, Bladen, Brunswick, Camden, Carteret, Chatham, Chowan, Columbus, Craven, Cumberland, Currituck, Dare, Duplin, Edgecombe, Gates, Greene, Halifax, Harnett, Hertford, Hoke, Hyde, Johnston, Jones, Lee, Lenoir, Martin, Moore, Nash, Northampton, Onslow, Pasquotank, Pender, Perquimans, Pitt, Richmond, Robeson, Sampson, Scotland, Tyrrell, Wake, Washington, Wayne and Wilson. Dec. 23, 2016 - Warren County was approved for public assistance. 50 counties eligible for PA; 45 counties eligible for IA. Nov. 21, 2016 - Montomery County was approved for public assistance. Additionally, the Department of Homeland Security issued an amendment to the Oct. 10 Hurricane Matthew disaster declaration to expand category designations and make all eligible for A-G assistance. 49 counties eligible for PA; 45 counties eligible for IA. Nov. 10, 2016 - One more county -- Franklin -- received a federal disaster declaration for federal public assistance to help support recovery efforts of local governments and nonprofits. FEMA also approved funding in 13 counties – Anson, Bladen, Chatham, Cumberland, Franklin, Halifax, Hoke, Johnson, Lee, Nash, Richmond, Scotland and Wake – to offset the costs of critical infrastructure repairs for local governments, state agencies, certain nonprofit agencies and federally recognized Indian Tribal governments that are located in designated disaster areas. 48 counties now eligible for PA; 45 counties eligible for IA. Nov. 3, 2016 – Seven additional counties -- Anson, Carteret, Chatham, Northampton, Perquimans, Richmond and Scotland -- were approved for individual assistance. 47 counties now eligible for PA; 45 counties eligible for IA. Nov. 2, 2016 – Hertford County was approved for individual assistance. 42 counties now eligible for PA; 38 counties eligible for IA. 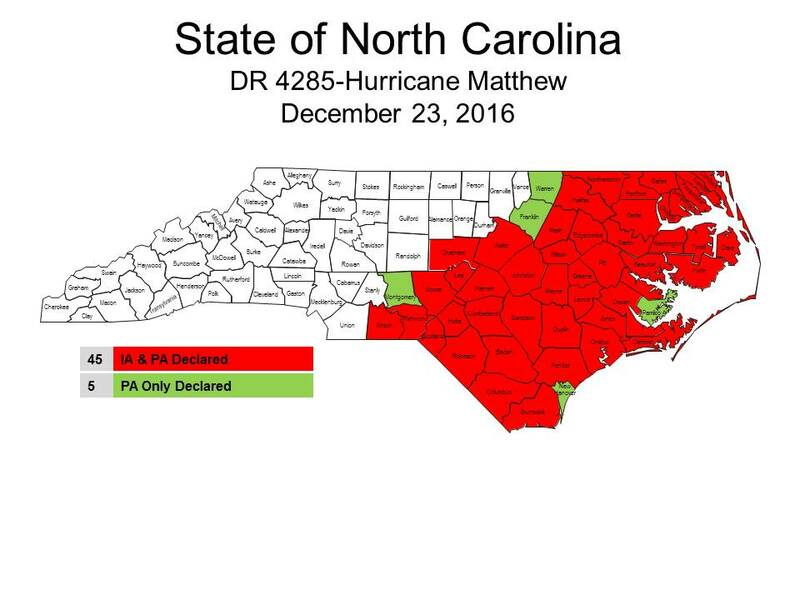 Oct. 31, 2016 – Brunswick County added for Individual Assistance, and Halifax County for Individual and Public Assistance. 42 counties now eligible for PA; 37 counties now eligible for IA. October 25 - One more county -- Hertford -- received a federal disaster declaration for federal public assistance to help support recovery efforts of local governments and nonprofits. Four additional counties that had previously received declarations for federal public assistance -- Camden, Chowan, Currituck and Pasquotank -- were also approved for individual assistance. 41 counties now eligible for PA; 35 counties now eligible for IA. October 24 – Three more counties – Lee, Moore, Wake – are approved for individual and public assistance. 40 counties now eligible for PA; 31 counties now eligible for IA. October 19 – One more county – Onslow – received a federal disaster declaration for federal assistance to help recover from massive flooding caused by Hurricane Matthew. Homeowners and renters can apply for federal assistance to repair or rebuild damaged homes. October 17 – Three more counties – Craven, Tyrrell and Washington – are approved for individual assistance. Martin County is approved for individual and public assistance. 37 counties now eligible for PA; 27 counties eligible for IA. October 13 – Two more counties – Gates and Jones – are approved for individual and public assistance. Dare, Duplin, Hyde and Pender are deemed eligible for individual assistance. 36 counties are now eligible for PA; 23 counties eligible for IA. October 12 – Two more counties – Harnett and Sampson – are approved for individual and public assistance. Greene County residents are eligible to apply for individual assistance. 34 counties are now approved for PA; 17 counties are approved for IA. October 11 – Three more counties – Bertie, Johnston and Wayne – are approved for individual assistance. Wilson is eligible for individual and public assistance. 32 counties are approved for PA; 14 are approved for IA. October 10 – Governor McCrory receives a federal disaster declaration for 31 counties for federal assistance to help recover from the massive flooding caused by Hurricane Matthew. Counties approved for public assistance (PA) only include: Bertie, Brunswick, Camden, Carteret, Chowan, Craven, Currituck, Dare, Duplin, Greene, Hyde, Johnston, New Hanover, Onslow, Pamlico, Pasquotank, Pender, Perquimans, Tyrrell, Washington, and Wayne counties. Counties approved for public and individual assistance (IA) include: Beaufort, Bladen, Columbus, Cumberland, Edgecombe, Hoke, Lenoir, Nash, Pitt, and Robeson counties. October 9 – Governor McCrory requests an expanded federal disaster declaration. October 7– Federal disaster declaration gets approved for 66 central and eastern North Carolina counties; provides federal assistance for emergency protective measures. October 3 – Governor McCrory requests federal disaster declaration assistance for help with costs of emergency protective measures in 66 North Carolina counties.